Location: Upper west-side corner of 103rd & Amsterdam, close to metro, not really walking distance to anything unless you don’t mind a really long walk. I never felt unsafe in the area. Favorite Part: Felt safe for a big city hostel. Really nice, updated bathrooms. Least Favorite Part: Lockers are expensive, assigned a bunk and in a co-ed room had to share with a male stranger, no self-service kitchen. My Thoughts: I first stayed in this hostel in 2004. We stayed in a private room which was essentially a dorm to ourselves. I remember the price being around $50 each (but that was also a very long time ago). Then, I loved it because it was only the 3rd big city hostel I’d stayed in and the HI – Washington DC Hostel and Bowery’s Whitehouse Hotel of New York were easily the the shadiest I had stayed in. I felt safe in HI – NY and that’s really important. The second time I stayed there was in July, 2011 after going to an airing of The Daily Show with John Stewart. The studio was only a $10 taxi ride from the hostel (which is expensive for anywhere else, but not NYC). It is obnoxious that it’s so expensive to store your stuff in their machine lockers. I much prefer the cabinets that I can lock with my own lock. They also had me share a bunk with a male stranger while my boyfriend (current fiancé) was on the bottom of the next bunk over. Also, it seemed that their co-ed room wasn’t a couples’ room and there were solo men staying there. This bothers me. I feel less safe. This was Adam’s first experience in a hostel and I’m pretty sure this made him uncomfortable too. Overall, it’s a nice hostel. It’s the best priced night in the city for the safety. People are friendly. They bring in acts (we saw a particularly bad comedian). The staff is very helpful and aside from my own hang-ups staying in a co-ed room, I felt safe. Adam had trouble finding the men’s showers and the experience of showering in a non-private bathroom was an interesting one for him, but I was REALLY impressed with the bathrooms. They were new and clean and the showers were warm and private. I would recommend this hostel, though it’s far from my favorite. 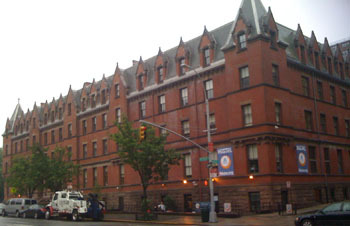 There is a better price farther downtown at Bowery’s Whitehouse Hotel of NY… DO NOT STAY THERE! It’s the shadiest place I’ve ever been! Rail: Amtrak - Penn Station, 5 km - take subway to hostel.